Each year, the SXSW Accelerator Pitch Event® showcases the most innovative and exciting technology from the global startup ecosystem, supporting new ideas and driving early-stage growth. Since its inaugural year, 403 participating companies have raised a total of $4.63 billion in funding. SXSW 2018 marks the event’s tenth year and largest to date. PitchBook, a financial data and software company, has compiled a decade’s worth of data into a report for the SXSW Accelerator Pitch Event. According to the new data, 2017 is on course to become the fourth straight year of more than $30 billion in venture capital commitments. What’s more, the available venture capital to deploy has reached a benchmark high, currently sitting at $92 billion. In 2017, the median angel and seed deal size surpassed $1 million for the first time, and the median pre-money valuation was pushed over the $6 million mark. For SXSW Accelerator participants, the median capital raised has reached $2.5 million. Download the SXSW Accelerator Pitch Event Report from Pitchbook to explore the 2018 industry categories and data on standout, past participants from the most VC capital raised to most active investors in SXSW companies and much, much more. 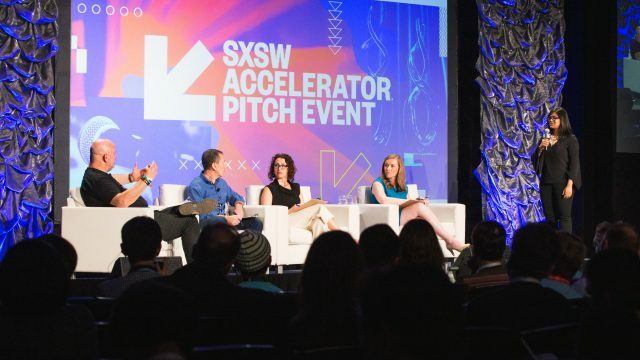 SXSW Accelerator Pitch Event is seeking inventive startups to participate, offering the opportunity to demonstrate their product and the possibility to obtain funding. Connect and compete in front of a live audience, industry experts, venture capitalists, and high-profile media at SXSW 2018 from March 10-12. Accelerate your startup company to the next level – enter your project before the final application deadline on Sunday, November 12, 2017.